« The Moravian Church had a rummage sale. On my way to pick up a friend today, I stopped at a garage sale in my neighborhood. 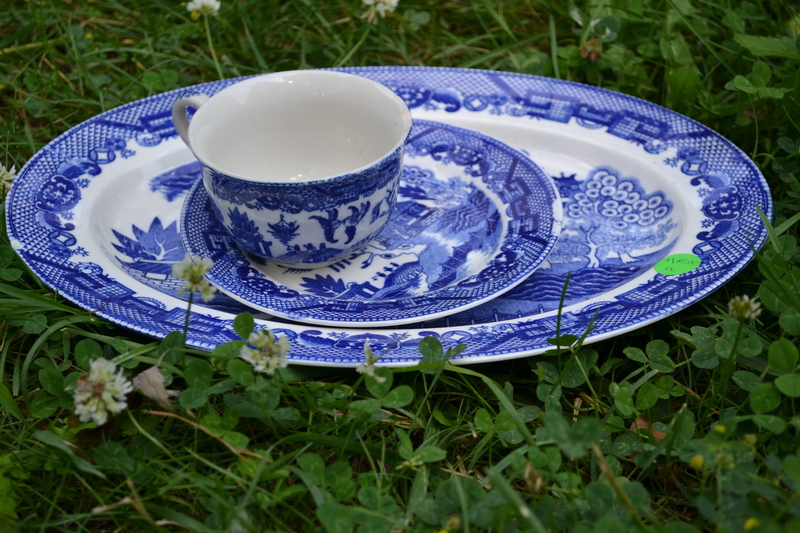 They’re usually terrible around here, but I found these three chipped pieces of Blue Willow china for a dollar. Generally I avoid chipped ceramics (nothing would make me sadder than a ceramic deer with a missing ear), but these pieces are old enough for the chips and cracks to seem somehow endearing. Most of my dishes are blue and white these days, so I have plans for these in my someday-it-will-be-new-and-white kitchen. And then, because the universe wanted me to be late, I stumbled across another sale a few blocks further along the way. 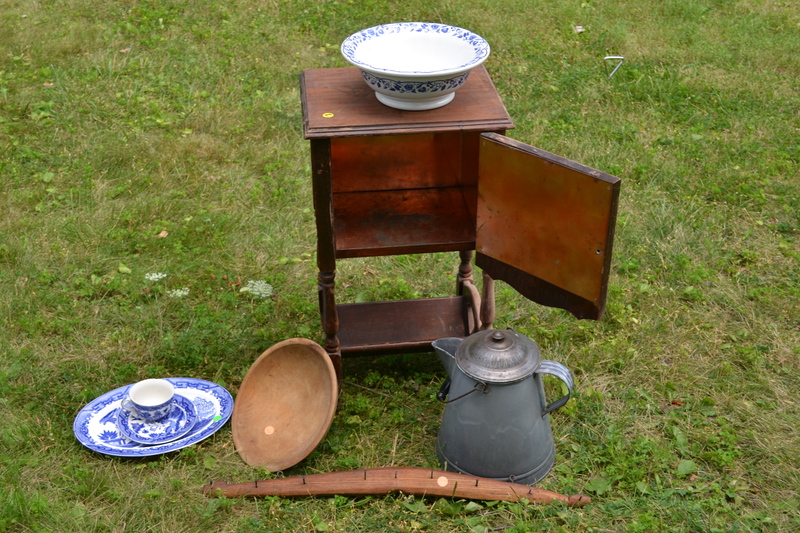 I bought a copper-lined tobacco cabinet for four dollars, a giant old tin coffee pot, and a wooden dough bowl. The cabinet needs some paint or stain, but I really liked the copper lining. As I as leaving, the woman holding the sale said she thought that she had something else I’d like: an old piece of wood that was once used for hanging up slaughtered hogs. She was right. My vegetarianism is complex. I did grow up, after all, eating tofu off of a scarred Eastlake table that my ancestors relegated to the barn and used as a slaughter table. The blue and white bowl on top of the cabinet is Shenango china; it’s from the same sale but I didn’t buy it at the same time. 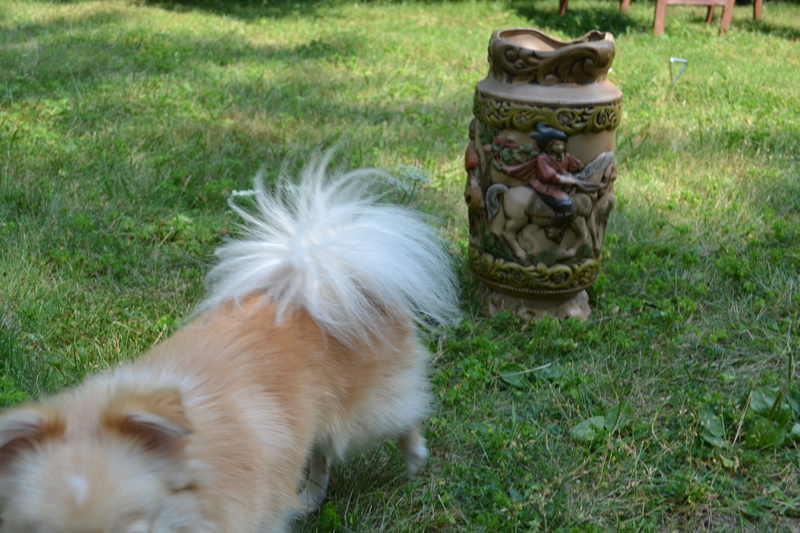 I came back a few hours later—after checking out a weird but not great estate sale and hauling six forty-pound bags of water softener salt—because I had been thinking about getting the bowl to add to my blue and white china. I caught the sale just as the owner was packing up and she was happy to sell it to me for half-price. Shenango china comes from New Castle, PA—just a few towns over from where my mother’s family comes from. Perhaps it was meant to be. Don’t worry. I didn’t pay for the umbrella stand. It was a bonus with my other purchases. It’s kind of hilarious, though. Ugly in a good way? Maybe not. We’ll see. maybe spray paint the umbrella stand to match your little yellow cabinet? oooh… That could be fun. Or maybe bright green, to match nothing! Great finds-like the cabinet. A little Briwax might do the trick.